Last week the price of gold and silver traded mostly flat after huge run-ups the previous week. What is of importance was that the 10 year U.S. bond had its yields hit a one month low – as bond investors expect a slow down in the economy. 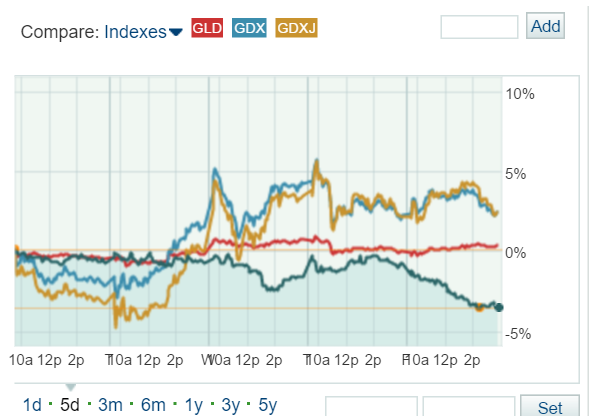 Last week saw gains in the GDX (blue), GDXJ (yellow) and GLD (red) as the U.S. 10 year bond (dark green) fell. 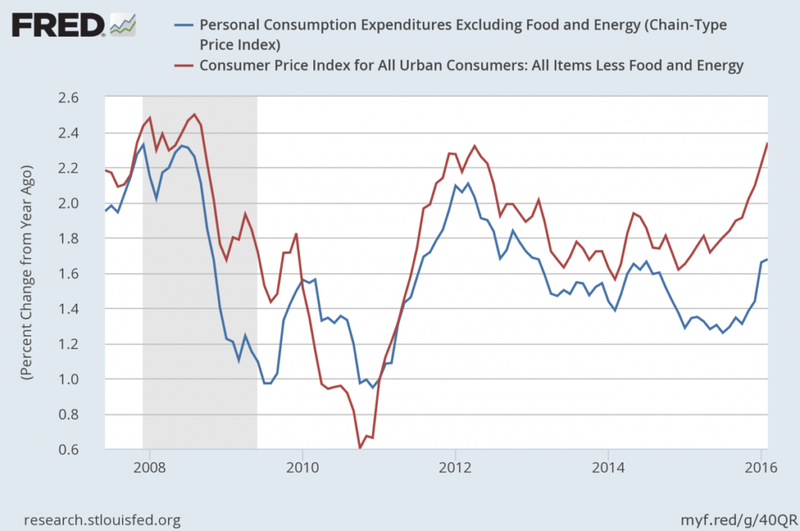 The real issue is between the lines: core inflation is reaching some of its highest levels since 2008. Core inflation is already above 2%. And if the 10 year bond yield continues to sink, that is causing a negative purchasing power of savings and bonds (1.7% nominal interest rate minus 2.4% core inflation gives -0.7% real interest rate). True, the core inflation excludes food and energy which are volatile, but whats the difference in -1 through +1 return over 10 years? It does not require math to understand savers are being squeezed as the cost of living continues its rise. The cost of living has kept outpacing real returns on top of citizens being crippled by severe booms and busts (2000 tech stocks, 2008 housing, 2015 fracking related stocks). It is no surprise why Americans just broke the record for working past 65. Three in five retirees surveyed by the Transamerica Center for Retirement Studies said making money or earning benefits was at least one reason they had retired later than they planned to. Almost half said financial problems were their main reason for working past 65. Millennials, whom are straddled with unbearable college debt, are entering the work force at an ugly time. How can they pay off these debts if they can not get a career in their field? With individuals working longer to supplement their income and retirement, plus high paying jobs at cycle lows (manufacturing, oil, mining), the young adults are cornered. Unfortunately for them, expected interest payments don’t pause. Thus it is difficult to purchase a home and other goods with so much debt already on the young adult’s credit report. Instead, today individuals are not getting any interest, and paying a higher cost of living – making the $200,000 bleed away. Byron King, as well as many others, is voicing his concern of growing problems for the Comex. The amount of physical in storage versus the number of registered “owners” is at an unbelievable ratio. 542-to-1 to be exact. This means that for every physical gold ounce in the vault there is 542 individuals with a claim on it. Simply, there will be 541 individuals who will not get the physical gold. Over the last decade, gold has flown from the West (U.S., Britain, Switzerland) to the East (Russia, India, China, Middle East). This is a scenario that will eventually collapse, especially as the ratio grows larger. Click Here to read the article and understand whats going on with the Comex. What good is owning “paper gold” if one can not redeem it for the physical? Emerging economies which have been selling good’s to the U.S. for years, and they have accumulated massive dollar reserves. But if the Fed has to act ‘independently’ and cut rates further and into negative, or additional quantitative easing, what happens to the dollar? Being overweight a currency of a nation that has dire future prospects offers more risk than reward. That is why a shift from emerging economies massive reserves of dollars and into gold is prudent. In the 1990’s the developed and Western nations argued against gold and for its demonetization. The argument was that gold paid no interest. Yet those who sold watched as the price of gold exploded 600% from 2002-2015 as interest rates worldwide turned to 0. At least gold does not pay negative interest, which roughly 1/3 of global bonds do as of April 2016. Click Here to read more about the case for emerging economies to stock more of their reserves with gold. In a response to a question of a U.S. Politician (asking what the Fed plans to do in the event of another downturn), Yellen said that the use of negative rates is not off the table. Remember: 9 days before Japan’s central bank kicked rates negative, Haruhiko Kuroda (Bank of Japan Chief) publicly said that negative interest rates would not occur. His decision sent shock throughout the system. What would happen if Yellen swiftly pushed rates negative? Are the average investors prepared for such a situation? Bonds issued in the reserve currency have never been negative (nominally negative) before. This author believes negative rates are all but assured to happen in the U.S., and sooner than many think. Follow This Link to read more about Yellen and her views on negative rates. 4. “Gold Rally is Only Beginning,” Says Famed Investor Paul Singer. Billionaire hedge fund manager Paul Singer is sharing the same bullish gold sentiment that fellow Billionaire Stan Druckenmiller does. This is only the beginning. After years of low rates coupled with massive money printing, the economies of the world were supposed to be in the clear and back to higher growth, thought the majority. Yet, 8 years after 2008 and it appears the only thing that has grown is debt and unforeseen risks. The investors clung to every optimistic word that the Central Banks fed them and ignored gold for years. But now reality has shown that their actions (stopped hiking rates, EU + Japan went negative) show more than their cheap words. Click Here to read more from Paul Singer’s investment thesis for gold and why it makes sense. Britain currently is undergoing a historic movement – a vote to leave the EU. As of now, the vote could go either way, but it is widely becoming the topic for European and Euro investors. If such a powerful country such as Britain leaves, who can leave next? If all the “stable” countries (Britain, Germany, France, etc) leave the EU and all the “unstable” countries (Spain, Italy, Greece, Portugal, etc) stay – how will the Union survive? Gold, silver are up sharply in 2016. Quality mining stocks are generating incredible gains for investors that were brave enough to buy during the dip when everyone else was fearful. At Gold Stock Bull, we believe the great gold bull is just now awakening from a 4.5 year slumber and that there is significant upside ahead. Click here to get our top gold and silver stock picks for 2016 and our top-rated contrarian investment letter.